Niobium is not found in nature in its free form, but usually in the form of oxides and usually with the tantalum element. The largest niobium reserves are in Brazil. 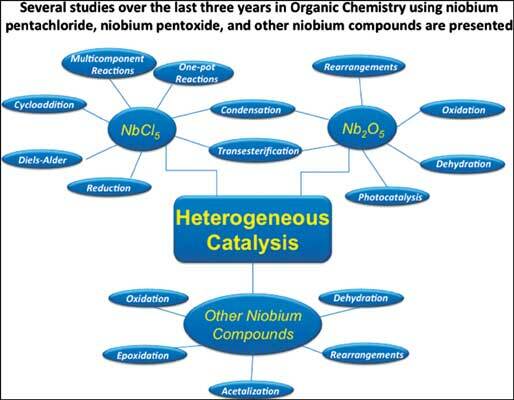 The use of niobium compounds in organic synthesis has increasingly attracted the attention of the international scientific community due to its wide range of applications. Among all the applications, we highlight heterogeneous catalysis. The compounds most widely studied in recent years are on niobium pentachloride, acting as a strong Lewis acid, and niobium pentoxide, acting as an acid catalyst or even as a support for other catalysts. In this review, we will discuss several studies over the last three years in organic chemistry using niobium pentachloride, niobium pentoxide, and other niobium compounds. Catalysis, heterogeneous catalysis, niobium pentachloride, niobium pentoxide. Departamento de Química, Centro de Ciências Exatas, Universidade Federal do Espírito Santo, Av. Fernando Ferrari 514, 29.075-910, Vitória, ES, Brazil.